View All Stores – Shop Now! HOT DEAL 11/7 Only – Amazon Echo $40 Off! In celebration of the Amazon Echo's 2nd Anniversary, Amazon has slashed prices on its Amazon Echo and you can now pick it up for only $140! . That price is a savings of over $40 and includes free shipping, but hurry cause its only available at that special price today 11/7. Amazon Echo can stream music, answer questions, read to you, give you weather and sports updates, and even control Smart lights and switches. Amazon also announced that Echo users will be getting exclusive deals when using voice ordering with their Echo. If you were interested in an Echo, this is a great time to pick one up and save even more on future Black Friday deals with Amazon! Amazon Countdown to Black Friday Live! Amazon has just launched their Countdown to Black Friday Deals Week ! Starting now through December 22nd, shoppers can visit the website and find thousands of daily deals that are refreshed every couple of minutes. Amazon has also put together a list of gift guides to make your holiday shopping even easier. Covering popular categories with offering such as their Electronics Gift Guide and Home Gift Guide , you can take the guessing out of your holiday shopping. In addition to all these great deals Prime members can now order thousands of products by using their Amazon devices such as Amazon Echo and Amazon Fire TV . Be on the look out for exclusive deals just for voice shoppers using these devices! The popular outdoor store RE announced it will close its doors on both Thanksgiving Day and Black Friday 2016. “The moment we announced our decision last year, people who build their lives around the outdoors really embraced the idea of reclaiming Black Friday. It took on a life of its own and became about much more than REI. #OptOutside should be a platform for the nonprofits and public servants who are on the front lines of the outdoor community. They’re the ones who make the outdoors accessible for everyone. That’s why, from today onward, we’re going to lift them up as the official spokespeople for #OptOutside,” Stritzke said. The latest Black Friday store hours making news today include two popular Black Friday favorites. Home Depot stores will be closed on Thanksgiving Day (however you can always shop online). The stores will open their doors at 6am nationwide on Black Friday 2016. Petco will also be closed on Thanksgiving Day (again you can always shop online). Petco stores will stay open from 7am-9pm on Black Friday. Walgreens has just released their Thanksgiving Day Sale Ad for 2016. These shopping deals will be available from November 20th - November 26th with the best deals available on Thanksgiving Day (November 26th). Walgreen's stores will open at 8am on Thanksgiving day nationwide. Dollar General's Black Friday 2016 Ad has just hit the internet. Dollar General stores will be open on Thanksgiving day from 7am to 10pm and black friday deals will be available for 3-days starting Thursday 11/24- Saturday 11/26. The first page of the flyer has deals that will only be available on Thanksgiving day so shoppers who need a break from the holiday festivities can get out for some shopping or pick up some the items that will be available on their website. You can view the full ad flyer here. 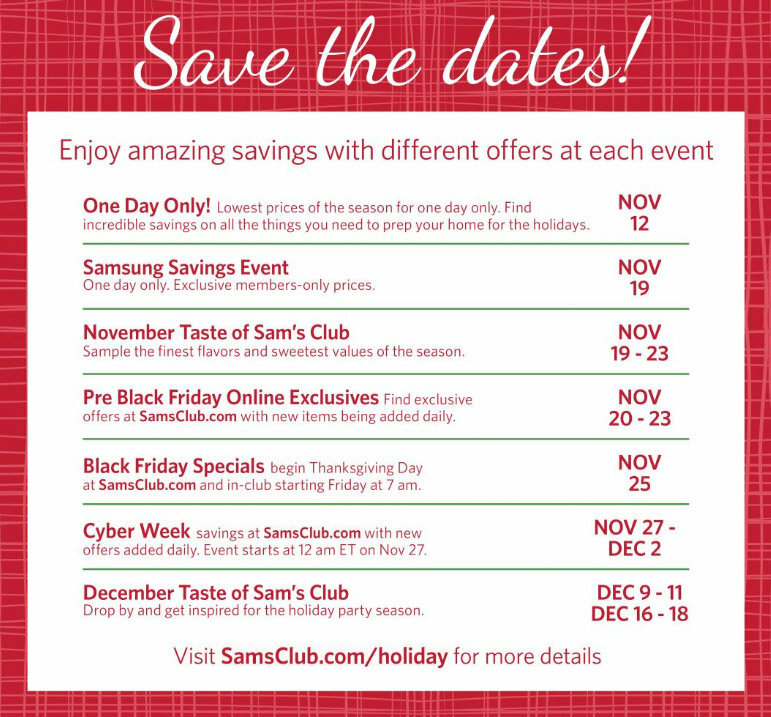 Sam’s Club Holiday Hours & Sales Announced! Sam's Club has just announced their store hours for the Holiday Shopping season and also announced multiple sales events dates. Sam's club will be closed on Thanksgiving and open at 7AM on Black Friday. Of course you can always shop online at the website. In addition to this information they are holding a "Pre-Black Friday Savings" event on Saturday November 19th. They will also have a pre-Black Friday savings and a Cyber Week sale. In early December they will unveil their "Shocking Values frenzy" as well. Sears “Black Friday Now” Event Starts November 2nd! Sears has announced that their Black Friday 2016 deals will start arriving on Wednesday, November 2. This "mini" 3-day Black Friday Sale running through November 5th is being called "Black Friday Now" and will offer a variety of deals in top selling categories. If your a Sear's Shop Your Way member you can save even more with exclusive offers. Specifics are elusive at the moment but we do know that Shop Your Way Members can save an extra 15% off home purchases of $50 or more. While this may not be the main Sear's Black Friday Sale, it promises to offer similar Black Friday pricing to get the holiday shopping season started earlier than ever. Best Buy has just unveiled its Top Tech 20 Holiday Gift picks.by Best Buy’s tech experts hand picked 20 of the hottest new and emerging technology products just in time for the holiday shopping season. Shoppers can browse, learn about, preorder or buy them now in Best Buy stores and on Best Buy . $10 off a $50 purchase on a different product category each week, including Grocery, Home, Apparel and Accessories, Trim and Toys. $25 off $100 or more in December as the promotion expands to allow shoppers to save even more. 10 Days of Deals will return offering a unique deal each day for 10 days. Free Shipping on all online orders from Oct. 25 through Jan. 1, 2017. 10% off Gift Cards on December 4th. 50% off One Toy Per Day between Nov. 1 and Dec. 24. Bass Pro Shops Black Friday Ad Leaked! Best Buy Black Friday 2016 Ad Unveiled. 16 Deals Available Now! Walmart Black Friday 2016 Ad Released! Target Black Friday Ad Released. Early Access Sale Going on NOW!